Good Stuff NW: They're (Almost) Here! Can you hear that? Like a stampede or an approaching storm or a train coming down the tracks, overlaid with that squeaky stretching noise a balloon makes as it inflates. It's the sound of tomatoes ripening in gardens all over the city, a deluge that will soon flood our kitchens and tables, prompting a frenzy of chopping and stewing and drying and canning to preserve the summer they contain. They're not only visible on the bushes in our garden, which are growing exponentially in this heat, but are also starting to show up at area farmers' markets in colors ranging from yellow to orange to purple to red, in stripes, dots and blushes. I picked up three nice-sized ones and brought them home, their sweet tomatoey scent perfuming the whole kitchen. An heirloom tomato salad was the original plan, to be served alongside one of the staples of our quickie dinner repertoire, pasta with Italian sausage. I'd chopped the tomatoes and tossed them with basil leaves, dressed only with olive oil and a sprinkling of kosher salt. I'd fried the sausage with garlic, tossing in arugula at the last minute to wilt it. Then, almost without thinking, I dumped the contents of the salad bowl over the pasta. Call it a happy accident or a stroke of genius (my preferred term, of course), but this is a one-dish meal that we'll be seeing a lot of this summer. Bring a large pot of water to boil. While it heats, brown sausage in frying pan, breaking into small chunks. Add garlic and saute till sausage is cooked through. 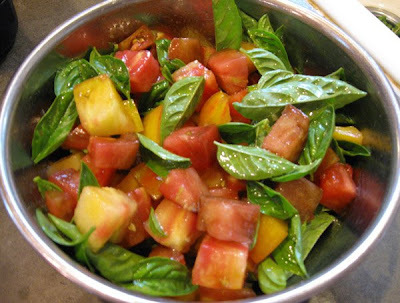 Chop tomatoes into 1/2" cubes and put in medium mixing bowl, combining with basil. Add olive oil to moisten and salt to taste. When water comes to a boil, cook pasta till al dente and drain, then place in serving bowl. Add arugula to sausage, stirring it until wilted. Add it to pasta and mix slightly, then top with tomato salad. Sprinkle with more salt, freshly ground pepper and grated parmesan, serving more parmesan alongside. Simple, fast, and delicious! Thanks KB! Lovely! So simple and divine. I know I'll get tired of them in time but I am so looking forward to this season's tomato glut. What a fabulous Portland summer this is turning out to be! Lots of pent-up tomato excitement out there! It's going to be a great season. One of our favorite sights in the store and in a salad is a rainbow array of brightly colored tomatoes. The best part is that those vibrant beauties look just as good as they taste—like little bursts of crisp, refreshing flavor for a hot summer’s day. Count is in for this recipe!